CHARLOTTESVILLE, VA – January 12, 2016: SHINE Systems & Technologies is pleased to announce the opening of our new Tampa Bay office located at 4017 W. Martin Luther King Jr. Blvd. 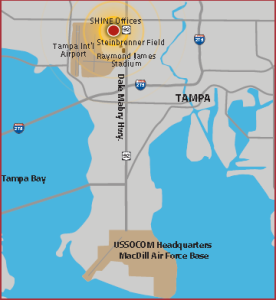 Tampa, FL 33614 and focused on Business Solution Services. Just minutes from Steinbrenner Field and the Raymond James Stadium, we are strategically located a quick drive down Dale Mabry Highway from MacDill Air Force Base and the US Special Operations Command’s (USSOCOM) Headquarters in Tampa Bay. Business and government customers throughout Florida who want to succeed with better and more innovative solutions are invited to engage our new office to learn more about our best-in-class Business Solution Services; Military and Identity Intelligence Analytics; and IT Solutions. Our services can make an impact that’s efficient and cost-effective to your bottom line. Heading up our Tampa location is Program Manager Roger Jones. Mr. Jones came to SHINE from Visual Awareness Technologies and Consulting where he worked as a Task Lead and Senior Exercise Planner. Prior to this, Mr. Jones worked at Northrop Grumman as a Senior Military Analyst and Exercise Planner. He is also a many times decorated Retired Colonel and a native of Hampton Virginia. Please visit our capabilities page for our complete service offering. 4017 W. Martin Luther King Jr. Blvd.